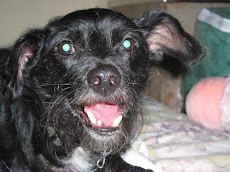 My dog says there are all sorts of dangers that can hurt or kill an outdoor cat. Cars, dogs, mean kids, coyotes or other predators, and the list goes on. Statistics show that kitties who are left outside live an average of five years, whereas indoor cats live 12 to 20 years. Cats also have a detrimental impact on wildlife as they frequently kill birds and have been known to attack other small creatures. If you think your cat might enjoy some fresh air, though, why not try an enclosure or a kitty stroller? There are lots of great products on the market, but I was particularly impressed with the variety at Kittywalk Systems (check out the Town and Country outdoor playground below!). Freestanding enclosures can be used anywhere and easily installed systems can enclose any patio. 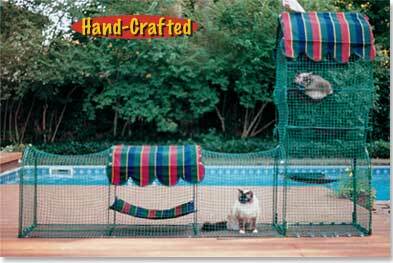 With an enclosed play area, your kitty can enjoy all that the outside world has to offer, but stay nice and safe! Meow! Personally, I'm all for "trapping" cats inside. You just have to make their world interesting and they are totally fine. So many dangers outside for cats. Besides, they are companion animals and if you dump them outside, you're denying them of being with you in the way that they want to be. I wish everyone would make their cat an indoor kitty!